With so many bold color palettes to choose from for fall, now is the best time to try out a shade you don't regularly gravitate toward. Whether you're always playing with color combinations or you're as committed as I am to the safety of black and white, there's a fall neutral we think you should absolutely try this season. Every fall, we talk about the rich seasonal hues like burgundy and mustard, but today we're proving that it's olive green which mixes so well with everything you already own. For a subdued feel, treat the color as you would any other neutral like beige or camel. But if you're more of a fashion risk-taker, we recommend wearing the green shade in allover monochrome. No matter which style tribe you subscribe to, there's an olive-green outfit that will speak to you. From bold trend-forward outfits to polished classics and everything in between, we're positive that there's an outfit combination that will inspire you to mix the green shade into your fall outfit rotation. 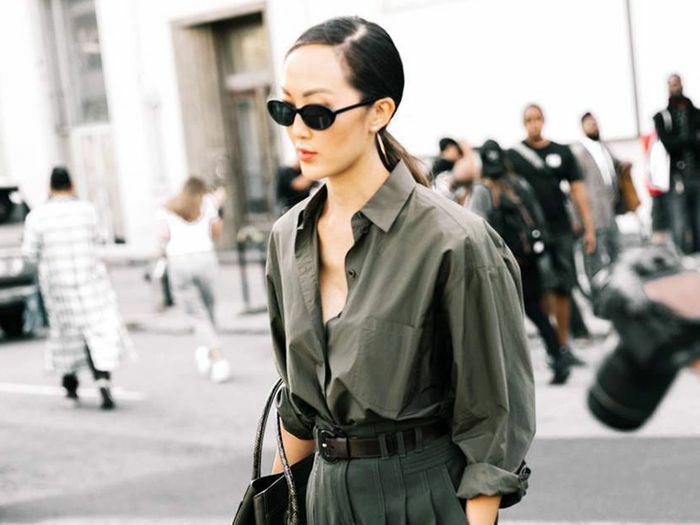 Keep reading to get inspired by how these stylish women are wearing olive-green outfits and shop the green pieces we love. Try one of the season's biggest shoe trends—metallics—with an allover green outfit. Gold complements olive tones so well. Our favorite sneaker outfit combo right now involves trousers like these and a crisp shirt. Try olive green trousers as a neutral to louder prints. Not your typical cargo pants. Elevate a workwear jumpsuit by pairing with satin heels. For all your party needs. A midi skirt and T-shirt are a fail-safe combo. For when you're tired of all the black sweaters in your closet. Add a leather belt to elevate a utility style jumpsuit. Balance out the boxy cut of this shirt by buttoning it all the way to the collar. Balance an army jacket with a pretty dress. We love the pleating on this. 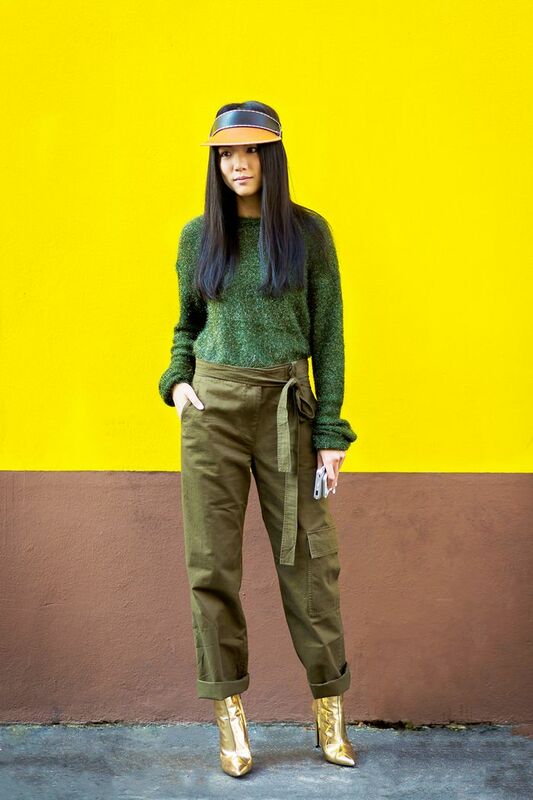 Utility-inspired pieces look best in olive shades. We'd totally wear this sweater with cool stirrup leggings and kitten heels. Wear a long shirtdress open as a duster jacket instead. This adds a polished touch to any outfit. Mix up your work wardrobe with green trousers. Go full-tilt athleisure in matching sweats. A green bomber jacket is the cool-girl favorite. You can never go wrong with a green bomber. Mix in different shades of green for an unexpected monochrome look.